While this dessert actually looks very tasty with all of that chocolate and cream, the presentation leaves a little something to be desired. We really don’t think anyone should be forced to eat food out of a flip-flop – those things are meant for your feet, not for the table! 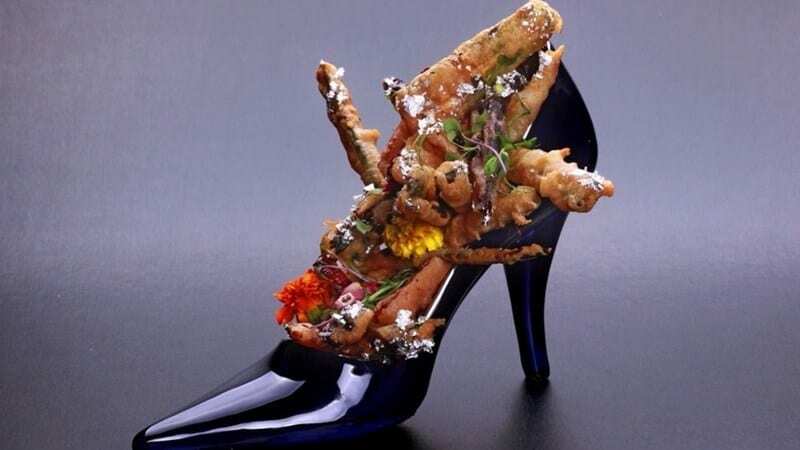 While serving food in shoes may be considered trendy or edgy, this just looks kinda unappetizing. We also don’t think there’s any way that this can be sanitary! It’s always a bummer when you order dessert and you wind up with something so tiny and disappointing. This beautiful little chair is not only not a plate, it also holds just one small strawberry, cut carefully in half. While we are very much fans of strawberries, we do not think that there’s any way this dessert is worth what the customers paid for it. The look on the face of that guy in the background says it all – what even is this? 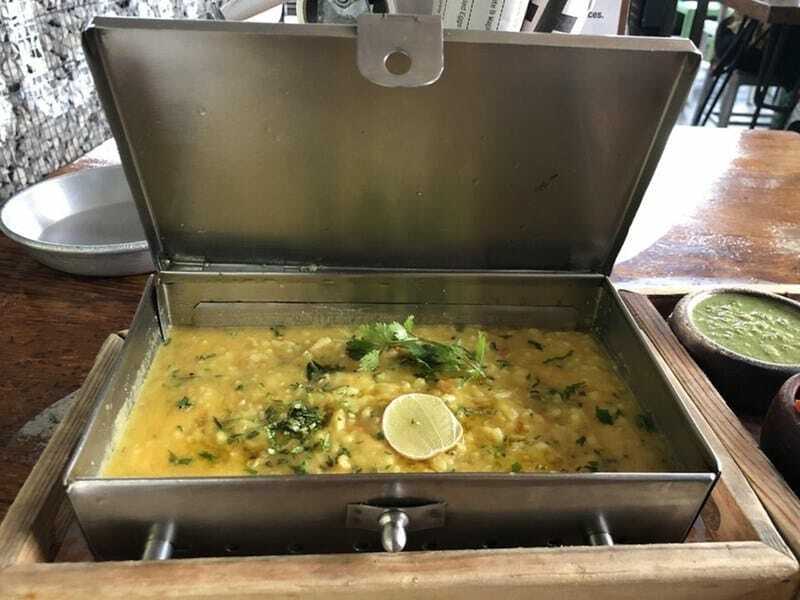 This appears to be some sort of metal briefcase full of curry, served in a wooden box. There are several problems with this meal, the most concerning being that we can’t see any sure way to clean it. That can lead to all sorts of health risks, and we wouldn’t want to be eating in a restaurant like that! Why not put it in a bowl, or at least a pot? We hope it tastes good, at the very least. It would have been much cheaper to simply use a plate. The sanitary issue comes up again with this plating, because as far as we know, there’s no way to scrub a tablet clean the way you would a plate. 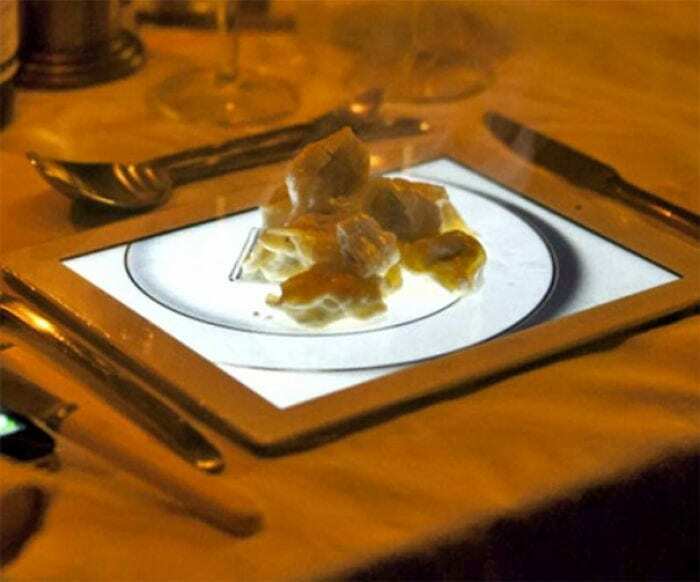 Sure, it’s creative, but we see no reason why it would be preferable to eat your meal off of a tablet instead of a regular serving dish. It’s slippery, and flat, and just seems like a waste of a perfectly good tablet! Is this dinner or some sort of a sick game? If you don’t grab your cheese fast enough, does the mousetrap close on your hand? We sure hope not! 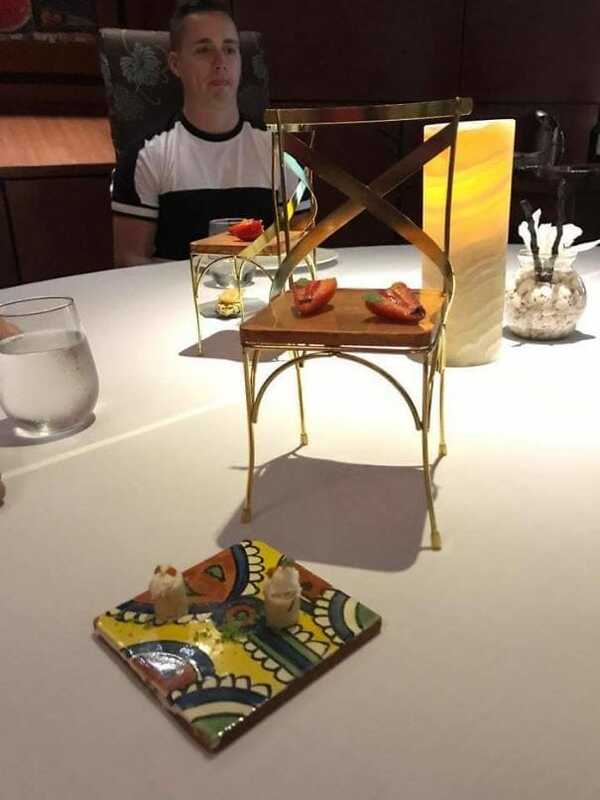 This plating doesn’t add anything to the flavor, and just makes us unsure if we would really want to eat whatever is being served, which just looks like some sort of fancy cheese stacked up with a leaf on top of it. It doesn’t really look like it’s worth the risk anyway. 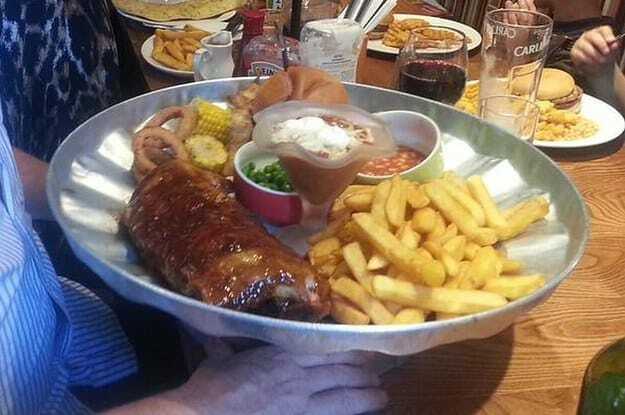 If a waiter brought this tray to the table, we would probably lose our appetite. Normally, a platter of crackers and cheese would be delicious, a great dish for friends to share. But when it shows up with some weird mouse skeleton on top of it, we would probably decide it wasn’t worth eating anyway. We’re not sure what the chef was thinking or what that thing even is, but it’s super eerie looking, especially covered in pieces of meat. If this is what it looks like – buffalo wings – then it is arguably one of the most delicious foods in the world. But someone decided it would be a good idea to serve it out of a dog bowl, making it look entirely unappetizing. There is a reason why we eat out of plates, and dogs eat out of dog bowls, and we don’t think that now’s the time to go around changing that status quo. How much would you pay to squeeze your own orange juice? Sure, fresh squeezed is part of the draw, but the other part of the draw is that someone else does it for you. 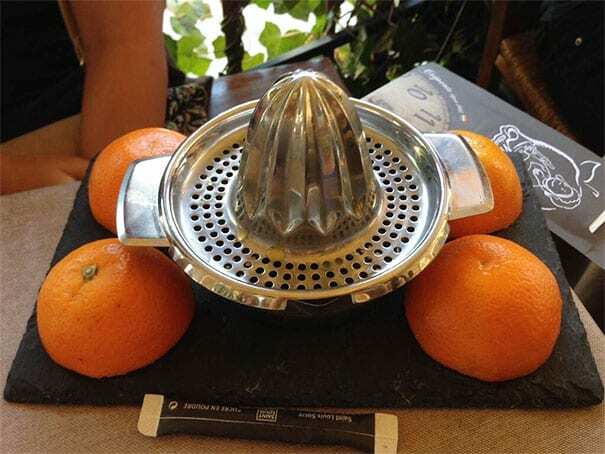 After all, if we wanted to squeeze our own orange juice, we would have done it at home. It’s just another one of those restaurants where you pay the chef more to do less. We are simply not convinced that it’s worth it, no matter how delicious that juice comes out. 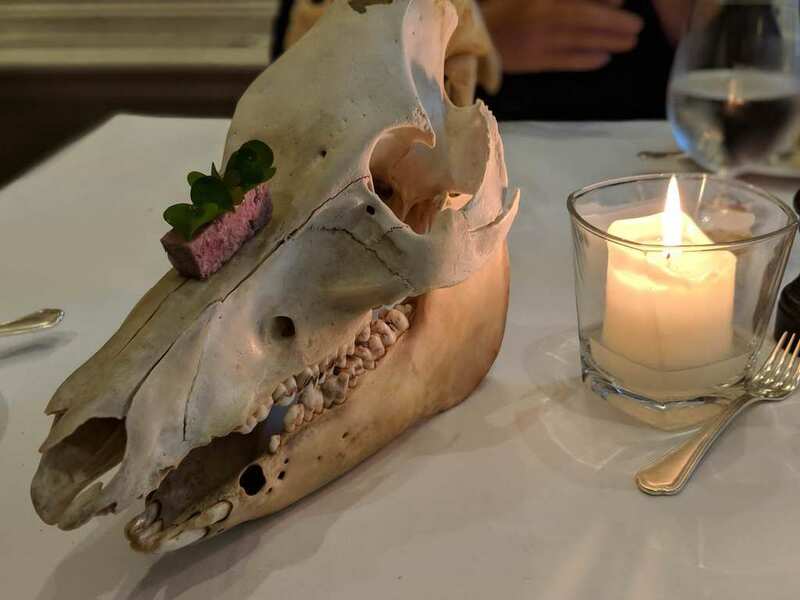 Serving food on a skull is such a bizarre idea, and we wonder who came up with it. Sure, there are some foods that you eat on the bone, like wings and ribs, but it tends to be the bone that the meat started out on. When you take the meat and put it on an unrelated bone, it just takes on a creepy feeling. 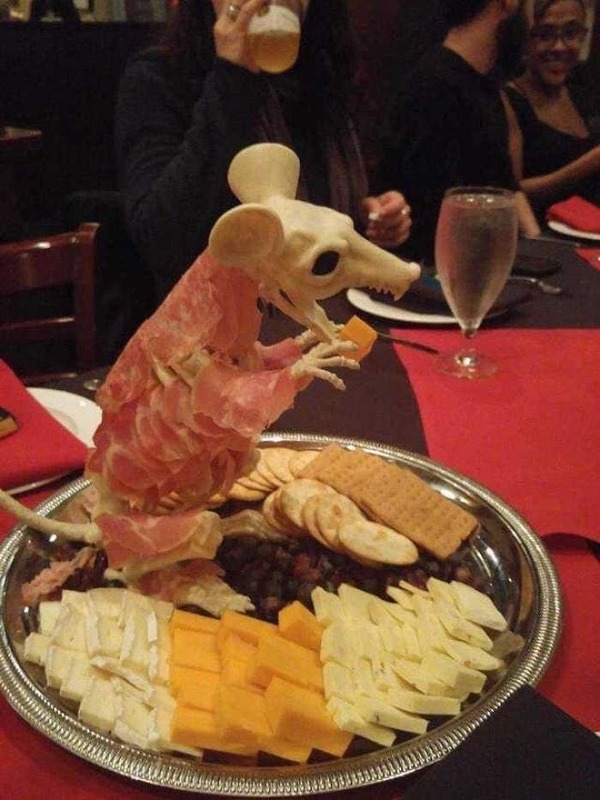 We wouldn’t want to eat that paté while staring at the empty eye sockets of that animal! 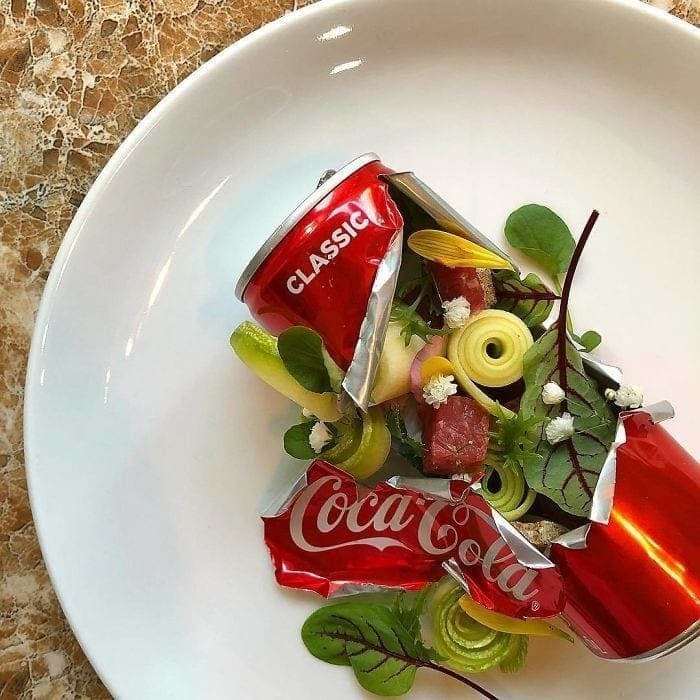 Honestly, this unmarked can looks pretty sketchy, and anything that comes out of it might be a little bit suspicious, even if it’s an expensive dish in a high-class restaurant. 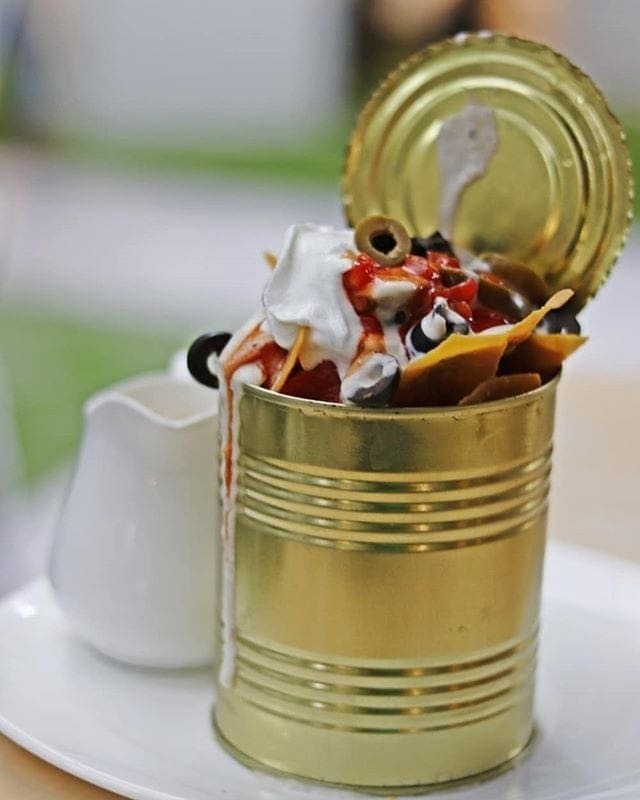 It also simply looks like an accident waiting to happen – there are sharp edges on that can, and it doesn’t look too hard to cut yourself when you reach for a chip! So if you do decide to eat this, which we aren’t sure is a great idea, be careful. When you’re looking for a place to grow your plants, you have your choice of nice pots. But when you’re looking for a way to serve bread, we usually go for plates. After all, bread won’t grow no matter how much water you give it. This serving idea begs the question: is this clever or just plain weird? We’ll let you decide. 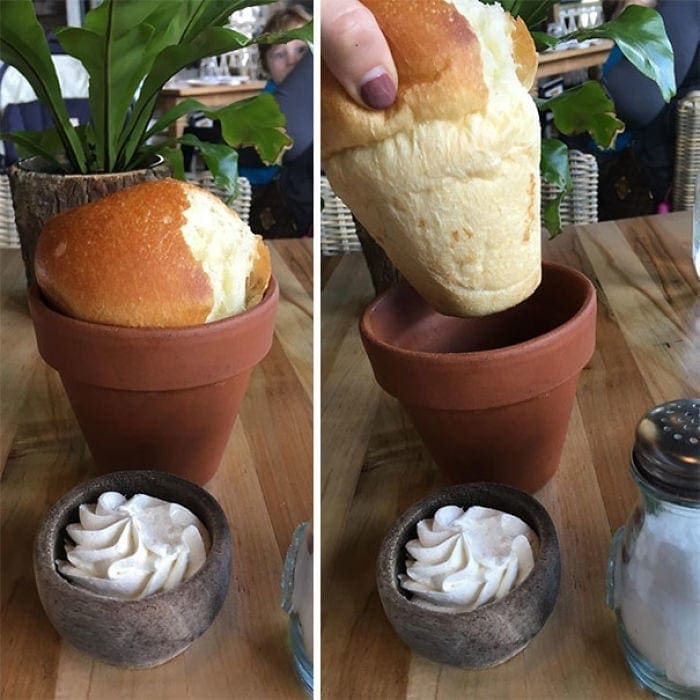 This bread does look delicious, though, even if it is served in an unexpected way. If someone put this dish on our table, we would probably get up and leave. Don’t get us wrong – we understand the draw of serving fish whole, because it can be really delicious. 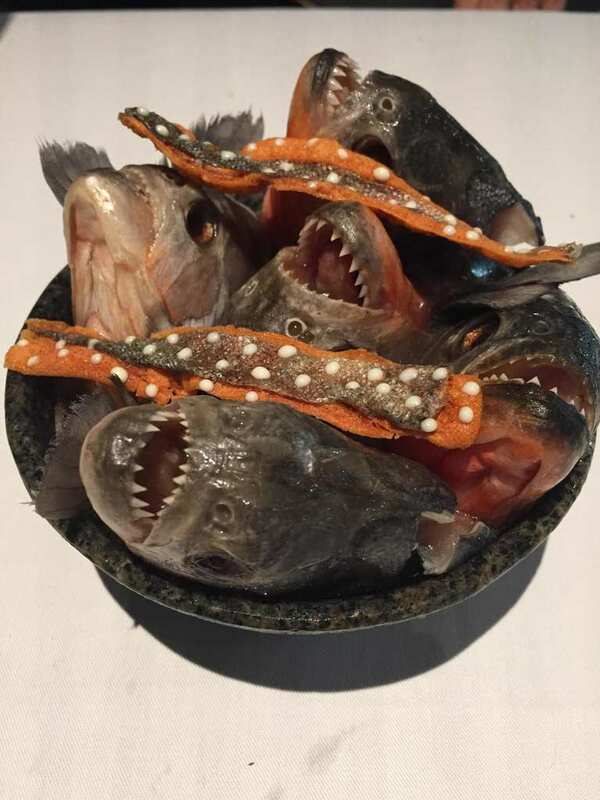 But these terrifying piranha heads are clearly just for show, or at least we hope they’re just for show, because we don’t even know how you would try to eat them. The combination of their staring eyes and sharp teeth just makes us lose our appetite! Some people spend a lot of time trying to teach their pets not to drink out of a toilet. So why would people eat out of a toilet? 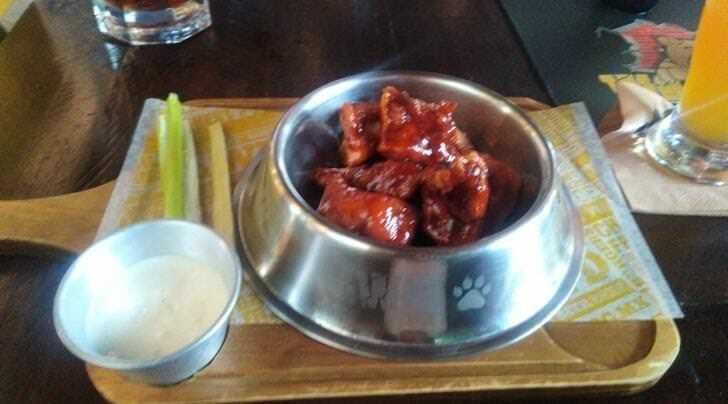 We don’t know who came up with this idea or why, but someone thought it would be fun to serve customers chicken wings out of a small toilet-shaped dish. 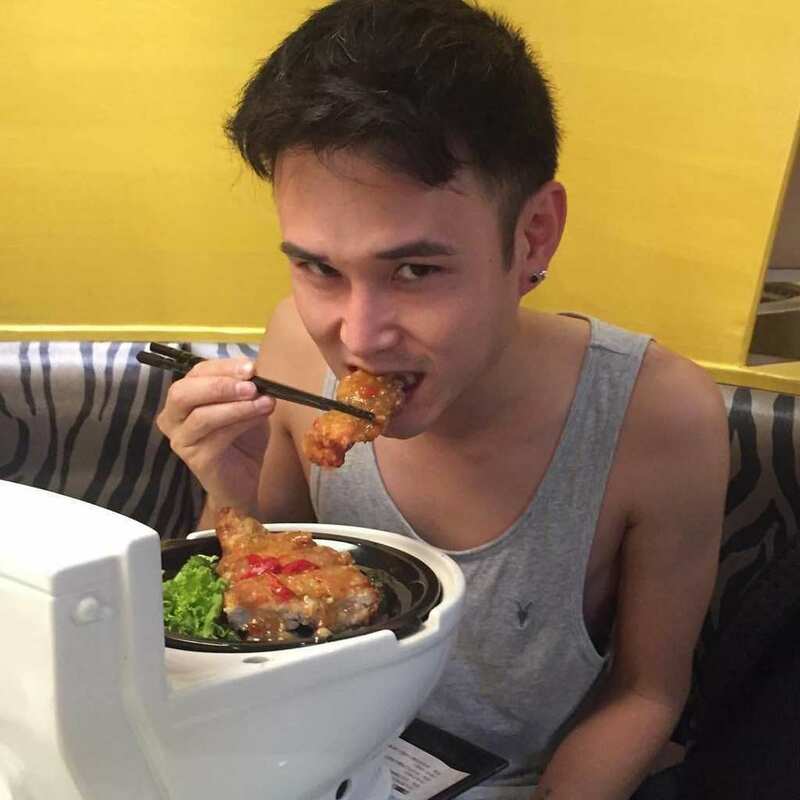 While this guy seems to be happily munching on his meal, we’re sure others will be put off by the idea of eating out of a toilet. This is another one that makes no sense to us. Tires are very unsanitary, and we would never think to eat food out of one. Usually, if food touches a tire it’s because it was in the middle of the road, and got run over. 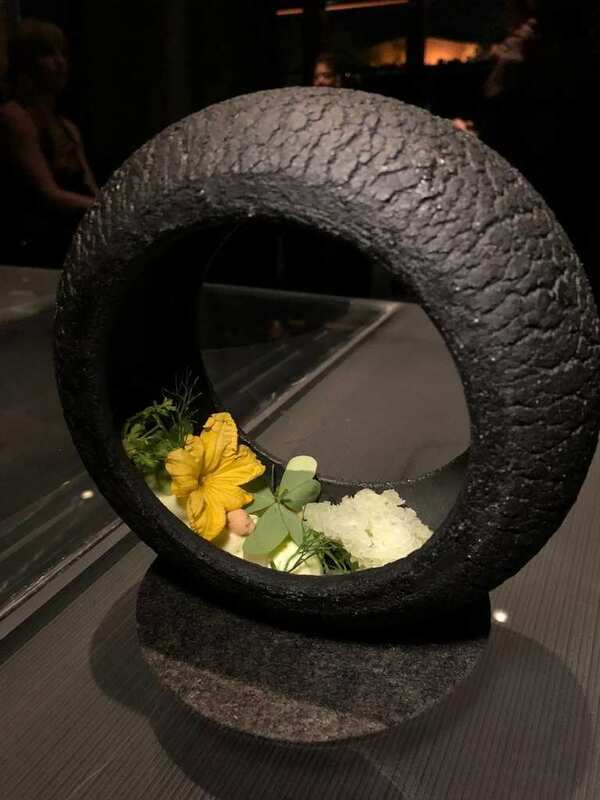 So the idea of serving this salad inside a tire seems pretty problematic to us. The salad itself looks very pretty, but we think it would look oh so much better on a plate. In this restaurant, you can just skip the dishes altogether. 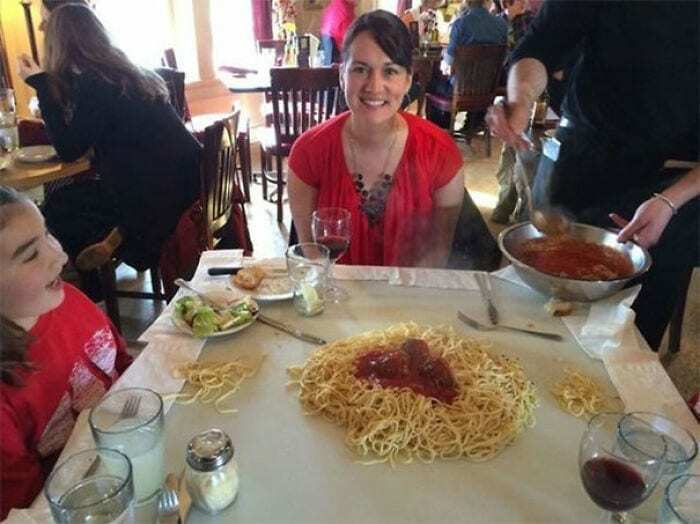 They serve pasta in a big heap in the middle of the table and you can just pull a scoop in front of you and eat it straight off the table top. It seems like a whole lot of unnecessary mess because with no plates, how are you going to keep the food from sliding off the table? This family looks pretty happy about it though. When someone asks for a cup of water at a restaurant, they expect to receive a glass of water, and maybe some ice. 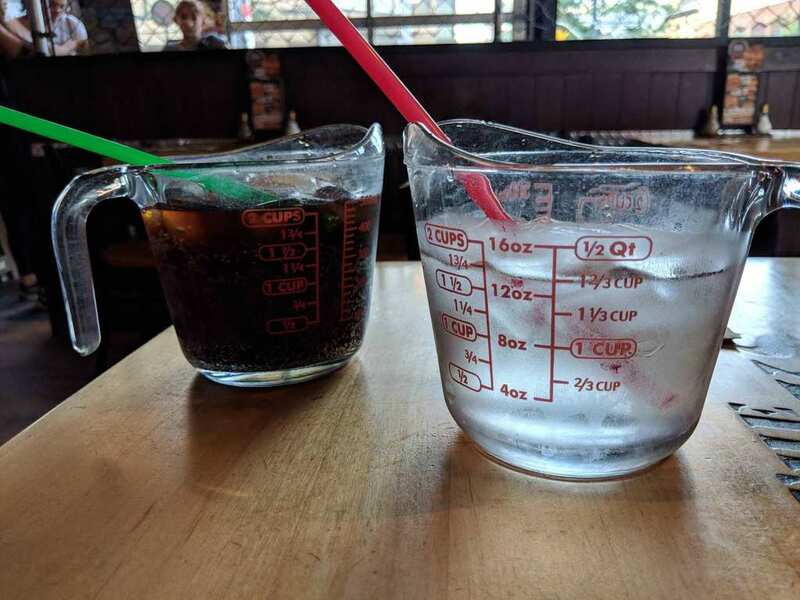 But at this strange restaurant, the customers receive a literal cup-measure full of their drink. Sure, at least they can see exactly how much they were served (in this case they got two cups! ), but it doesn’t look like a very practical way to do things. We would like to stick to a regular glass, thank you very much. Somehow, we don’t think that’s what umbrellas were meant for. 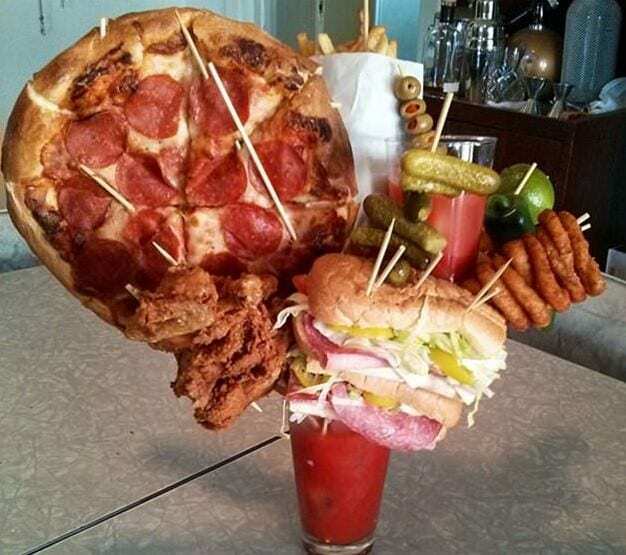 There are so many problems with this method of serving drinks. First of all, it looks quite unstable, like it could spill over on any of the diners at any time. It also takes up the whole table, so there’s no room for anything else next to it. And it simply looks hard to serve out of, not to mention to clean. It’s impractical and unsanitary, because you can’t really clean an umbrella as you would a plate. 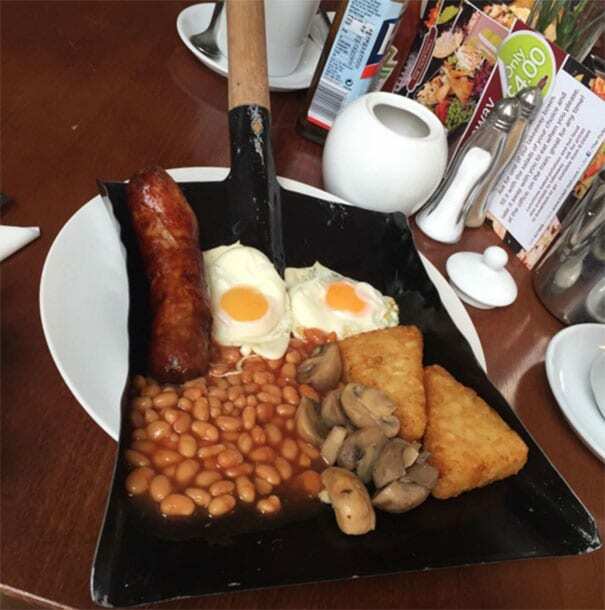 Serving food on shovels is more common than you might think, and every time we see it, we think about how bizarre it is. Again, there’s no way to clean a shovel like that to make it appropriate to eat food off of. Then we can move on to the impracticalities of it, such as the slanted surface, the difficulty making it stand, and large amount of space it takes up. Also, it’s on top of a plate, so why not just skip the shovel? This salad is absolutely beautiful, so why is it sitting inside a piece of trash? The can is not only garbage, but is also cut in such a way that it looks very sharp. If you reach your hand in there you’re bound to get cut. It’s some uncalled for branding that doesn’t really fit the mold of high-class food, and maybe that’s why the chef went for it. We would still rather eat that salad on a plate, though. This is an espresso shot inside of a tiny carrot cup. So after you finish your coffee, you can go ahead and have a tasty bite of carrot. Sure, it’s not your typical breakfast, but would you want to start your day this way? 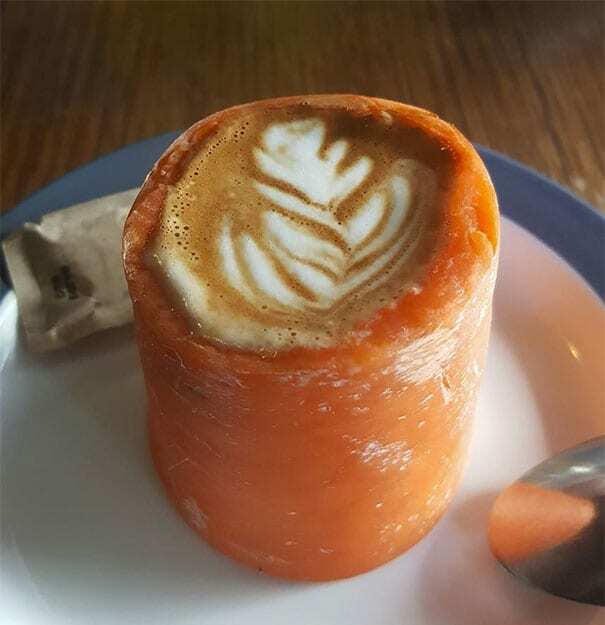 We are a little bit concerned that the coffee will retain some of the taste of the carrot, and we also wonder what they did with the inside of the carrot. Did someone eat it? We’ll never know for sure. This burger looks dangerous, and we don’t quite understand what the draw is with this one. 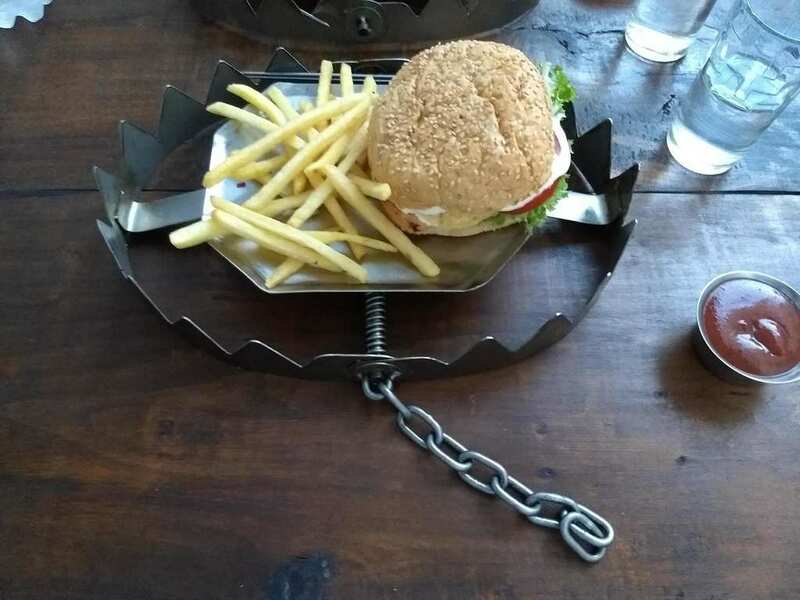 Hopefully, the bear trap on which the hamburger is sitting is not set to go off, or the person eating it could be in for a nasty surprise. This burger would be just as delicious on a plate, and it would be a lot nicer, a lot safer, and a lot less intense. 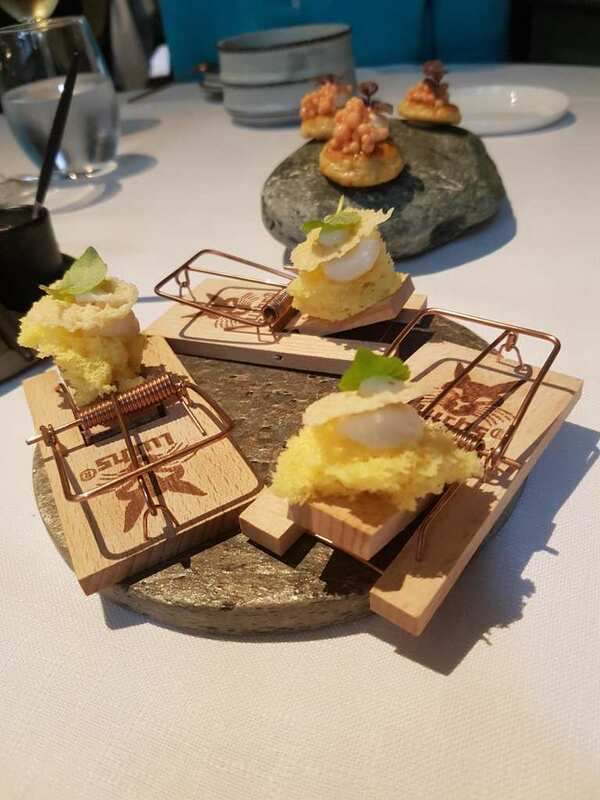 Food and animal traps simply do not go together. 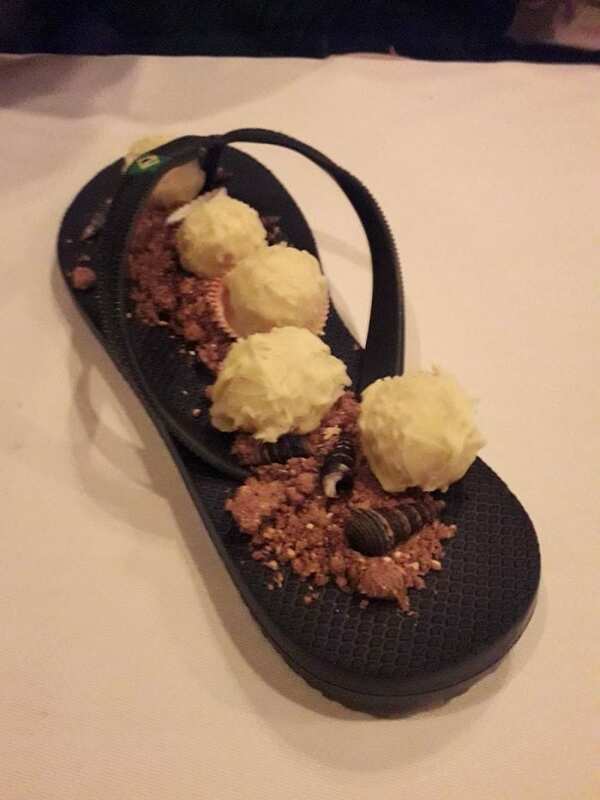 We’ve already seen a flip flop used to serve dessert, so it only makes sense that we’ll come across another shoe, this time filled with a starter. This shiny, black, high-heeled shoe is full of something fried, ready to be served. However, we remain of the opinion that shoes should go on feet and food should not come into contact with them, unless it’s accidental. Plus, that shoe looks way more expensive than a plate, and the price tag on the dish likely reflects that. When you order a plate of meat, you probably wouldn’t expect it to come draped over a doll. 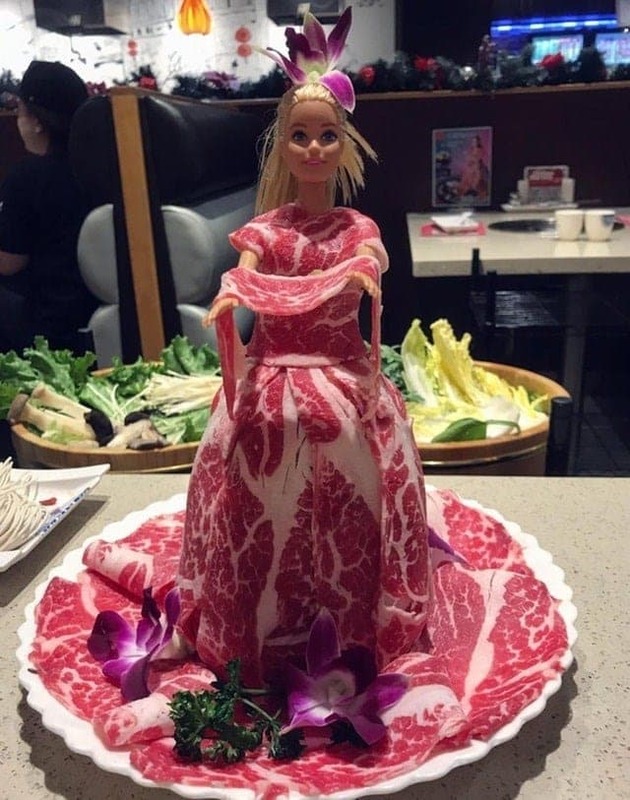 The meat is placed very well, forming an impressively intricate dress, but that doesn’t mean that we would want to eat it! It’s a very strange idea, and we can’t help wondering why anyone would dress a doll up in a bunch of pieces of meat. Plus, we also have to ask – how do they clean the dolls between customers? We have to wonder what goes through the minds of those who make the decisions in the restaurant world. 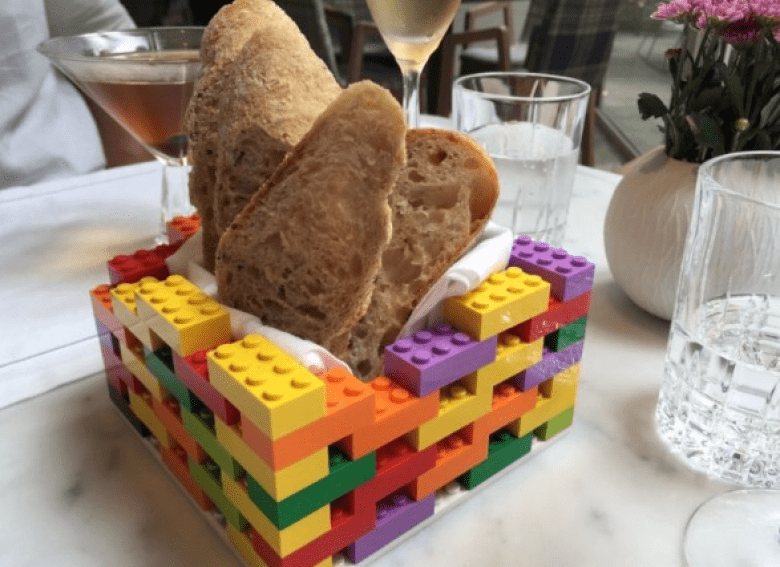 While we know that the food industry is laden with competition and that people have to stand out to make an impression – what kinda thought process led this particular restaurant to Lego? We’re not even mad, were genuinely just curious. Of course, we can’t deny that this poorly made Lego structure does make a fairly stable bread basket, but we’d like a few more bricks, please. This photograph makes us incredibly uncomfortable for so many reasons. While we don’t like to discriminate against those in the shoe world, it’s no secret that the Croc is at the bottom of the shoe chain. Because of this, the shoe in general is not something we wish to have in our minds. When you add a whole can of baked beans into the mix… things get even weirder. 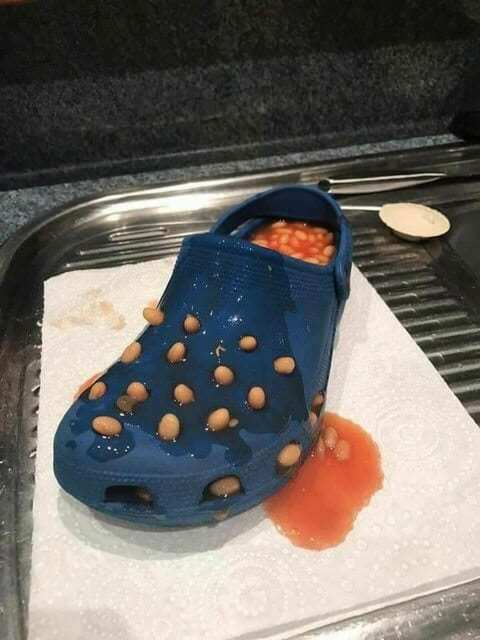 It’s the beans that are sticking out of the holes that make this so much worse. We just can’t deal. The more we look at this meal, the more confused we get. Is this a savory dish? Is it a dessert? In a way, it doesn’t really matter what this dish is called or the ingredients that go into it, because it’s still just as bizarre. 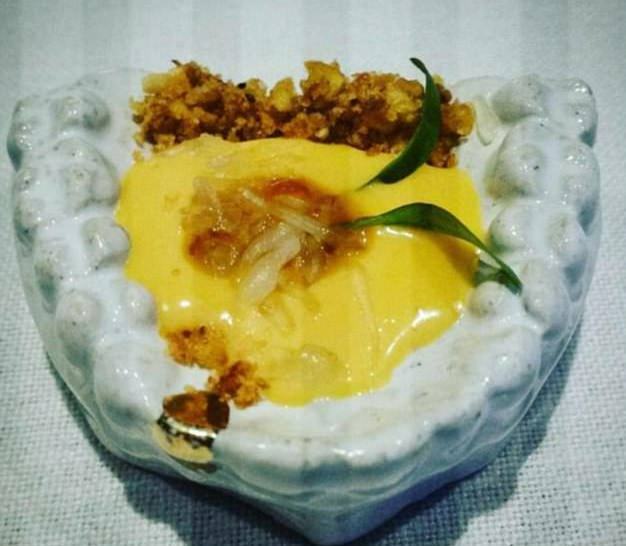 This restaurant obviously really want you to sink your teeth into this dish because they have created their very own mouth moulds to serve it in. It’s even complete with a gold filling. We do have to wonder whose mouth this belongs to though. When you go out for dinner, you often like to treat yourself. It’s the day that you don’t think about that diet that has made you hungry for weeks on end, and you like to give yourself the chance to have something delicious without wondering about the calories. 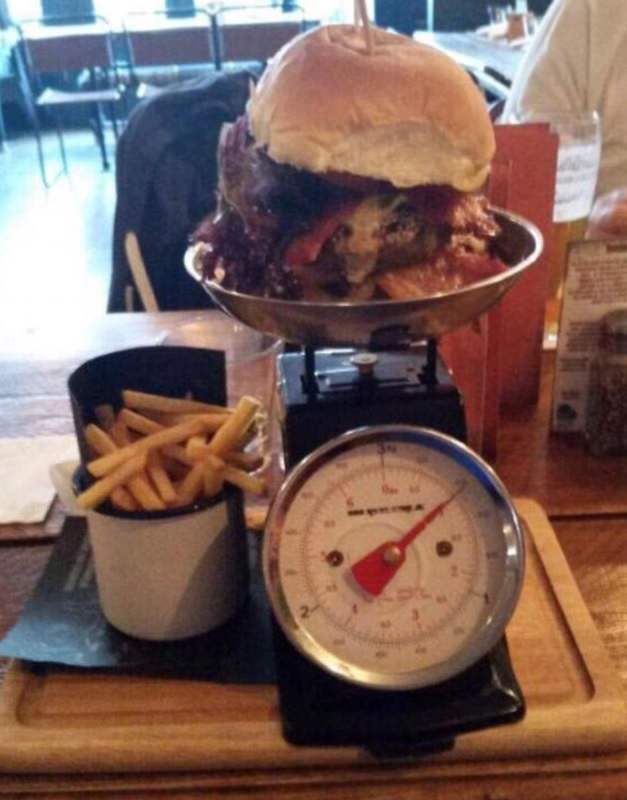 However, this restaurant decided to make that even more difficult for their customers, as they decided to serve their giant burger on weighing scales. You know, just so you can feel even more guilty about how bloated you’re going to feel in the morning. Many restaurants are now choosing to serve their fries and sides in little dishes and pots that are a little out of the ordinary. Most of the time, we love these little quirks – but sometimes we have to question the relevance. 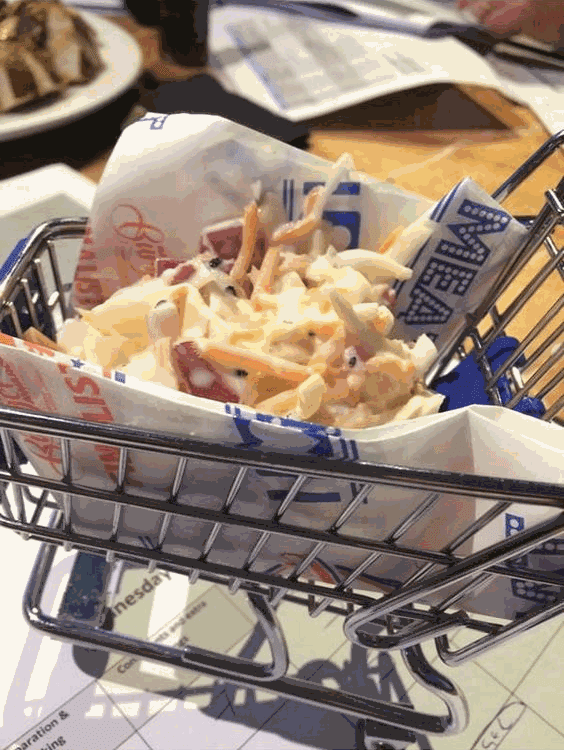 To serve their slaw, this place bought a whole load of tiny shopping carts. Excuse us if we’re being a little uneducated, but what do shopping carts have to do with slaw? We honestly can’t think of any reason, so have to go with the idea that they’re just trying a little too hard. We love a liquid lunch as much as the next person, but normally this involves a bottomless deal, and a few fries smothered in salt. 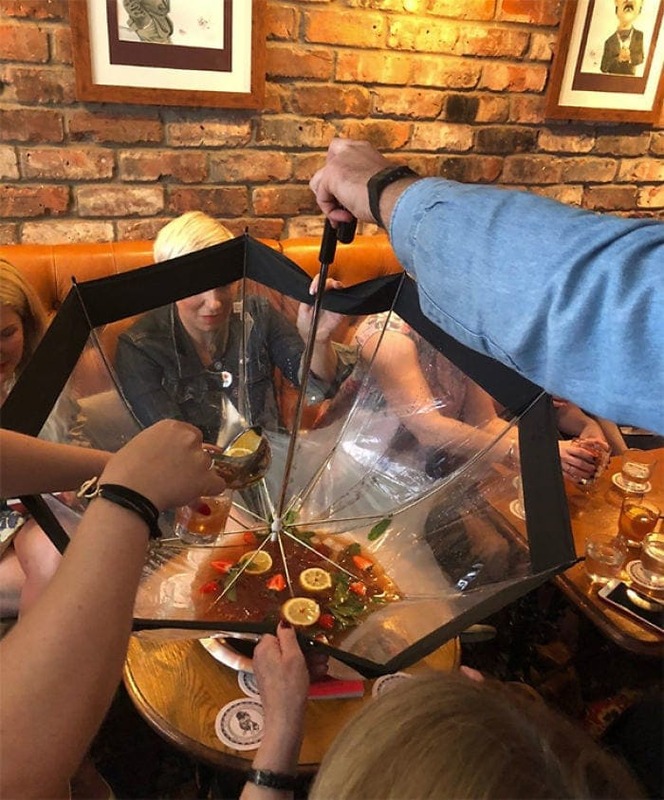 This particular restaurant decided to take the idea of a liquid lunch to the next level, and literally provide the liquid and the lunch, and we’re not sure how we feel about the finished product. For starters, that’s a very odd combination of food. Secondly, we don’t want to think of all those juices making their way into that drink. The more you look at this photograph, the more you realize just how excessive this really is. 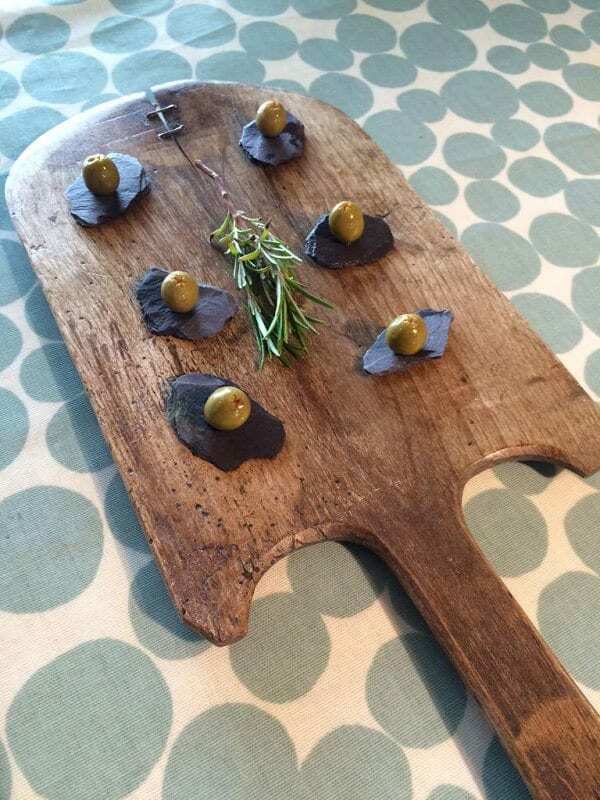 Not only is the whole dish served on a giant wooden paddle, but each individual olive is then served on a shard of slate. Why? Well, we have no idea. When it comes to ordering a few olives for the table, we’re happy to have a tiny little bowl that we can simply shove out of the way while we’re eating our main course. We don’t need all of this kerfuffle, and we don’t even need the rosemary. We’re not gonna lie; this food actually looks rather delicious. There are sandwiches, there are cakes, there are smoothies, pastries, and a whole lot more – and we could eat this whole thing. However, we have to question the presentation here, because we’re getting a little confused with this table-ception. 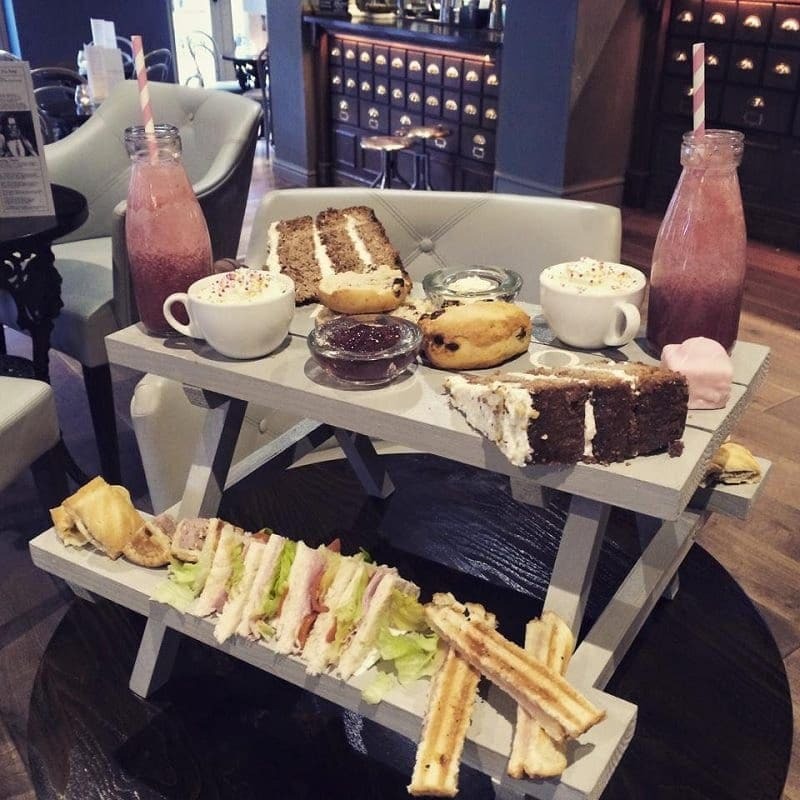 Not only does this bench table serve as the plate, but the bench table is then placed onto another table for the sake of the diner. That’s just too many surfaces for our liking, and we’d just like to eat our food without so many tables. No, your eyes aren’t deceiving you. 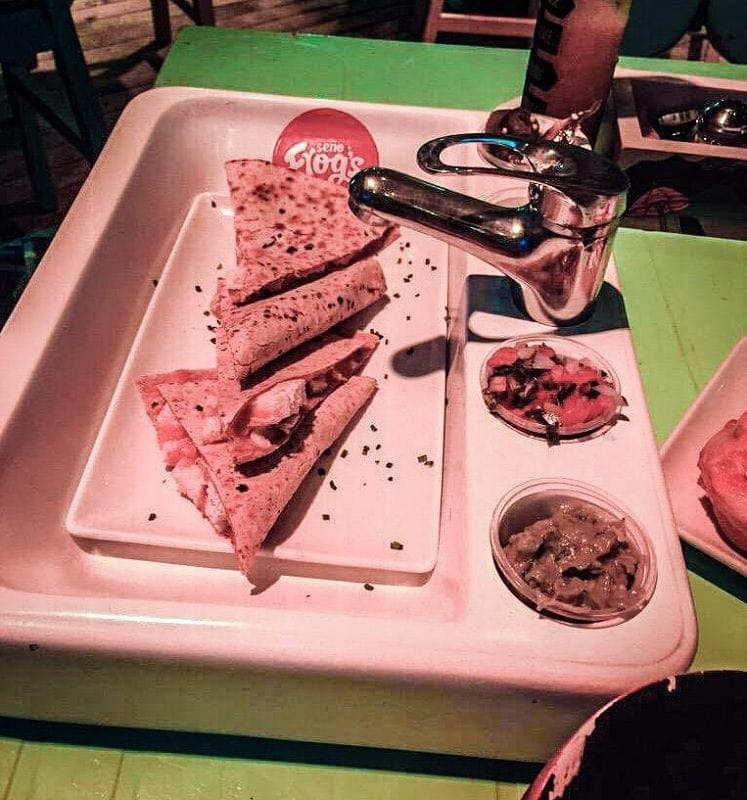 Yes, that food really is served in a sink. However, if you look closely, you might actually realize that the food isn’t simply placed in the sink for people to enjoy. Instead, it is placed on a plate, before being placed in the sink. So, what’s the use of the sink in the first place? The only reason we would choose this dish would be if a creamy cheese sauce came out of the faucet like water. We really hope it does that.